Inside the station, most of the stuff has been dismantled, and the food stall owners have vacated the place, leaving it almost empty except for some tables, chairs and other discarded items. I remember a shot I wanted to take near the toilet which I wanted to take, but was stopped by the infamous toilet janitor. I found out later from Instagram user aikbengchia that he’ll scold whoever points a camera in his direction. However, the janitor is now a different person. 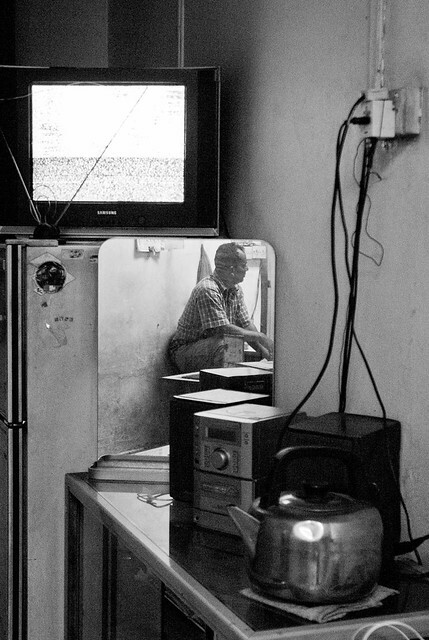 One of the janitors of the Tanjong Pagar Railway Station toilet reflected in the mirror. A mini hifi and TV are his only forms of entertainment when he’s working. The platforms are crowded with lots of people, and not wanting to squeeze with them, we decided to shoot the trains from along Keppel Road where several people armed with cameras has gathered. Many has illegally parked their cars by the roadside to take photos of the historic moment. I setup my tripod there and began to regret not bring my taller one, which would have helped me clear the top of the fence. By now, it’s too late to do anything and I’ll have to make do. At about 10:30pm, a train rolled in amidst cheers and waves from the crowd. Passengers also waved back to us as the train passes. It’s dark and there’s no way I can get a clear shot of the moving train, so I used the long exposure to render it as a streak of light and to contrast it with the stationary train. The long exposure also brought out some colour in the sky, which was pretty dark at that time. 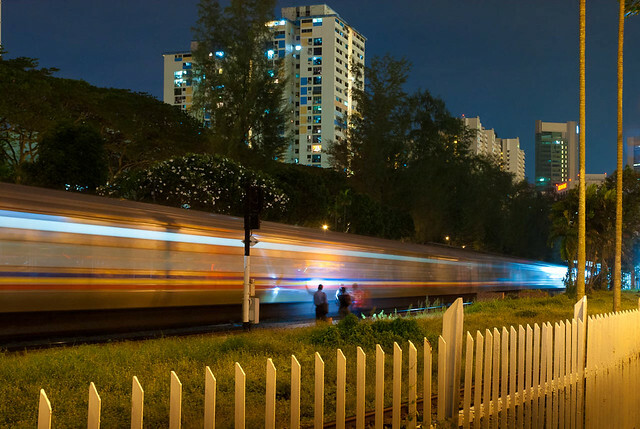 A train arrives, leaving a trail of light as another waits to depart at Tanjong Pagar Railway Station. 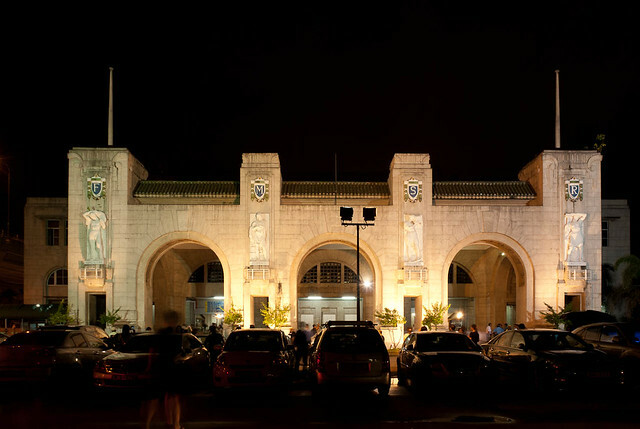 The last passenger train departs from the Tanjong Pagar Railway Station at 10:30pm as bystanders wave to the passengers. Thinking that this was that last train out, we packed and was about to leave when we saw another train leaving the station. I’ve packed my tripod by then, so I had to make do with high ISO, flash and a little panning. When I read the papers the next morning, I found out that the pictures of the train the sultan was in had the same number as this one. But the timings does not appear to match – the shot I’ve taken below bears a time stamp of 10:41pm but the media reported the train leaving at 11pm. 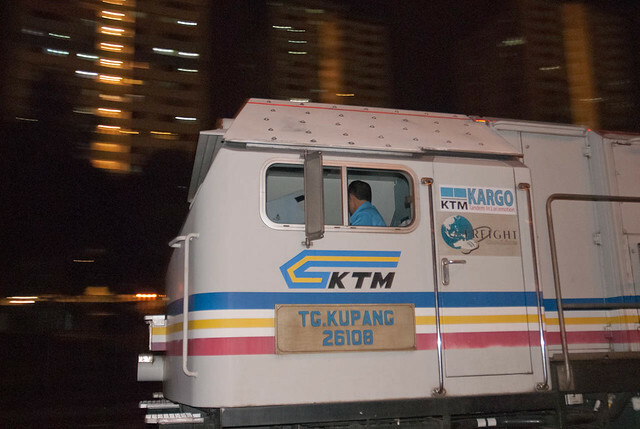 I checked with Kar Gee who was shooting from the Kampong Bahru Flyover nearby and he mentioned that a train did pass at 11pm, so I am kinda stumped. I guess I need to do a little asking around to unravel the mystery. This was supposed to be the last train driven by the Sultan of Johor out of Singapore. 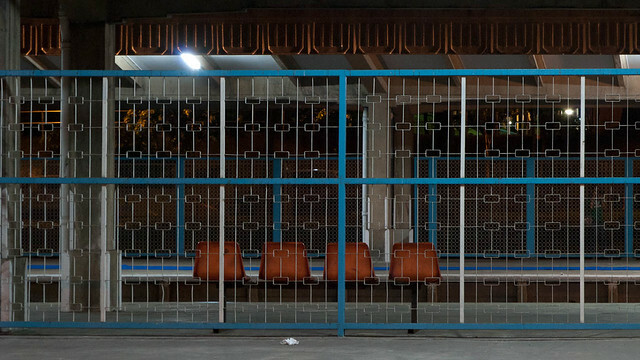 On the way back to the station, we came across the empty platform, and 4 empty chairs. The place will remain quiet for a long time to come. All is quiet again after the trains left the station. Back at the station, the crowd is squeezing to have photos taken with the last train which had rolled in earlier. 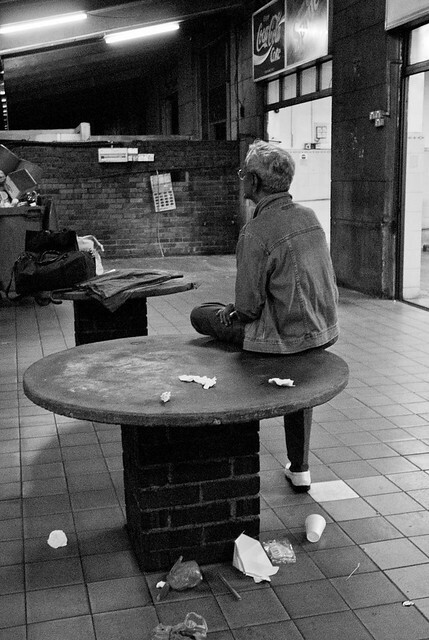 Meanwhile, a man sits on a stone table at the arrival platform possibly reminiscing the old days and savouring the last moment. A man savours the last moments after the last train pulls out of the station. With a heavy heart, we left the station. 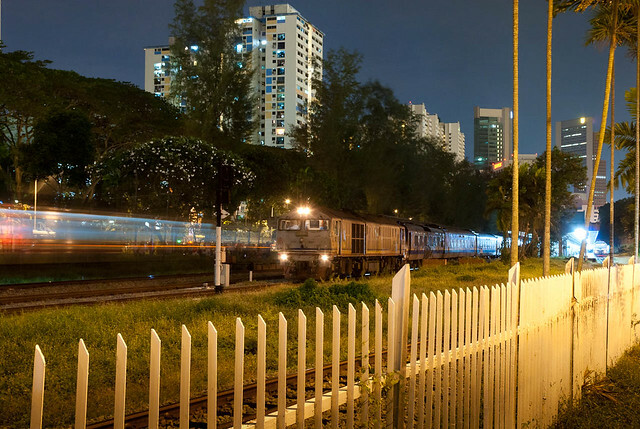 In less than an hour, Singapore will take ownership of the KTM railway land between Tanjong Pagar Railway Station and Woodlands and from 1 July 2011, trains will now arrive and depart from the Woodlands Train Checkpoint. The railway track will now be silent.